Hitman Go and Lara Croft Go are some of the most clever puzzle games of the last few years - and Deus Ex is about to join them. Square Enix announced today that Deus Ex Go will arrive on tablets and mobile devices this summer, translating Adam Jensen's infiltration exploits into turn-based challenges. Jensen will use his usual suite of augmented combat and hacking abilities to navigate the levels, running down a terrorist plot with assistance from his Deus Ex: Mankind Divided allies. 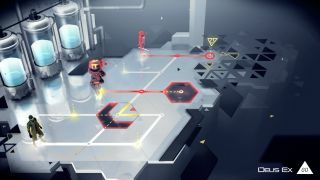 Square Enix also confirmed that it will release a full level editor for the game soon after its release, which should mean you'll have plenty of new puzzles to try. UPDATE: Speaking of the Go series, Square Enix just started selling an App Store bundle with the first two games.